The “Festival of Philanthropy”, that is the Joy of Giving Week, is a time when India gets together to give and serve, a time for everyone to do their bit and spread happiness. Like every year, the Joy of Giving Week 2011 was celebrated from October 2-8, and Toybank joined in on the celebrations with a slew of interesting events that engaged children and adults alike, spreading joys across the city. The celebrations started on Oct 2, the birthday of Mahatma Gandhi, the father of the nation. Toybankers visited Snehasadan, a home for homeless children, for a story telling session for the children. Kids at the centre listened keenly to Gandhiji’s stories. Many also narrated stories that they knew. The interactive session brought out quite a few yarn spinners from the lot who thoroughly enjoyed narrating tales to their fellow mates. Later the kids drew pictures of the Father of the Nation and even wrote a few lines on him and shared them with us! The festivity spread to every child, and Toybankers left Snehasadan waving back to smiling & cheerful faces. Kids at Snehasadan making their Gandhiji Pics! The next stop on the fun train was YMCA Juhu. True to the theme of the day, Toybankers held a long discussion with the kids about Gandhiji’s Dandi March and Satyagraha Movement. Later, Toybankers taught the children how to make a Gandhi cap from a simple newspaper. Kids had a great time with this activity, making caps and showing each other their fancy creations and before we knew it the whole bunch was sporting caps and we had our very own batch of Dandi March-ers. Learning and fun don’t seem to be good partners, but seeing the enthusiasm the kids displayed during and after the session, The caretaker of YMCA had to remark, " this is the best event we could have to teach the kids about Gandhiji in a fun way! " Kids at YMCA posing with their Gandhi caps on! The Joy of giving week is for everyone, and to ensure that the ‘grownups’ aren’t left out of the celebrations, Toybank reached out to various corporate organizations and business houses ranging from financial service firms to IT giants. Toybankers set up kiosks across various offices where working professionals got to know more about Toybank and the work we do. Many individuals registered with us as volunteers for our events, quite a few also bought our badges to wear their support for Toybank on their hearts for the JGW. Toybank also organized sensitization workshops for professionals to make them aware of our cause and our efforts. Many organizations also organized toy-collection drives, collecting a large number of toys for the children we serve. Often professionals want to contribute, but with demanding schedules they fail to find opportunities at the right time, hence our outreach efforts were warmly received across all organizations and ‘Joy of giving’ spread a pleasant warmth in the corporate sphere. Toybank also reached out to a number of schools and educational institutions, interacting with students, who are the future of our society. A sensitization workshop was conducted for children at Avalon Heights School, St. Gregorios School and Dalmia College. 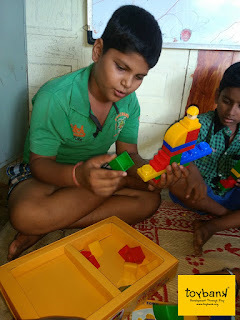 Young minds with loads of energy found Toybank’s cause of returning childhood particularly endearing. Every session was highly interactive and the youngsters threw volleys of questions at Toybankers wanting to know more and more about our work and the children we serve. The students also arranged a massive toy collection in all the three institutions. Toybank collected almost a 100 bags of toys for just these three institutions! At Tridha School too, Toybank conducted a sensitization workshop for the children. Students at ICoFP donated 2 bags of brand new toys to Toybank. Toybank also setup a kiosk at Little Oaks School on the open day to reach out to the parents of the children in the pre-primary school. Quite a few parents came to our kiosk and got to know more about Toybank. They also brought Toybank key chains, badges and greeting cards! Across schools students and parents alike showed tremendous interest in Toybank and its activities and pledged their support to our cause. The feelings of empathy and sharing generated in the young minds we interacted with were the prize for the efforts of the Toybankers. The joy of having shaped the youth for a responsible future is a feeling hard to describe. While Toybankers were rushing through all these establishments to spread our message, several other Toybankers across the city spread the ‘joy of giving’ by arranging Toy collection drives in their respective localities. People came out in large numbers to donate toys and Toybank received about thirty boxes of toys from such collection drives. Rotract club of Lala College and Rotract club of Uptown also chipped in with their own collection drives. Toybank also conducted a lot of play sessions at the play centre during the week. Toybankers visited their play centre in NGOs like Daya Sadan, St. Catherine’s Home and Parivartan Shikshan Santha. All in all, the Joy of Giving week 2011 was one in which Toybank saw unprecedented interest and contribution across all sections of society. Such a massive participation by one and all across the city really reaffirmed our belief in the inherent goodness of humanity. 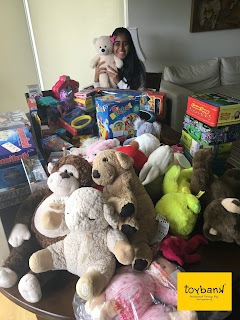 Be it the kids at school who were happy to donate their own toys, or the busy professional who took out time to volunteer or the students who pledged their support to our cause, everyone experienced the Joy in Giving during the “Joy of Giving Week” .